You can probably guess the top few people or organizations cited for doing the most to undermine the scientific basis of climate change last year, but perhaps not who did the most damage. Was it the Koch brothers for funding a massive disinformation campaign, Rush Limbaugh for relentlessly ridiculing anyone who takes climate change seriously, or Newt Gingrich for killing a chapter that acknowledged the serious problem of human-caused climate change, which was scheduled for a book of environmental essays he is coauthoring (due out after the election)? According to a panel of climate scientists and journalists (“climate communicators”) the winner is . . . all the Republican candidates, says Peter H. Gleick of Planet 3.0. Fox News and Murdoch’s News Corporation shared second place, while the Koch brothers ranked number 4 for lavishly “funding the promotion of bad climate science,” outspending even ExxonMobil in this regard. Reading the details of dishonesty and hypocrisy on the part of journalists and scientists, even misleading information offered by an “expert” testifying at a Congressional hearing, makes it clearer why leaders and policymakers have felt little pressure to solve what some have called the biggest problem the world has ever faced. In his introduction to the list with its substantive supporting evidence, Gleick cogently explains the failure of our leaders to act, either to slow the harmful emissions or prepare for inevitable consequences of climate change. Why this inertia in the face of overwhelming evidence from scientists? In part [it is] because climate change is a truly difficult challenge. But in part [it is] because of a concerted, well-funded, and aggressive anti-science campaign by climate change deniers and contrarians. These are mostly groups focused on protecting narrow financial interests, ideologues fearful of any government regulation, or scientific contrarians who cling to outdated, long-refuted interpretations of science. While much of the opposition to addressing the issue of climate change is political, it often hides behind pseudo-scientific claims, with persistent efforts to intentionally mislead the public and policymakers with bad science about climate change. Much of this effort is based on intentional falsehoods, misrepresentations, inflated uncertainties, or pure and utter B.S. – the same tactics that delayed efforts to tackle tobacco’s health risks long after the science was understood (as documented in Naomi Oreskes and Erik Conway’s book, Merchants of Doubt). Read all of it here; prepare to be disturbed. More about climate skeptics and who is likely to be one in a later post. Still, I’ll end on a glass-half-full note, with Freedman’s last paragraph and a couple of links: “Given the seemingly endless stream of depressing climate change news, some confidence-building measures, such as the ones analyzed in the study, could be exactly what we need.” If you want to help, visit The Partnership for Clean Indoor Air (PCIA) media page to read feature stories about their work to improve efficiency of cookstoves used by billions of people worldwide and donate if you are convinced. Also, see Berkeley researcher Daniel M. Kammen’s paper on the various stove models that have been tested (with illustrations). This blog would be easier to write if I just linked to sunny digests like this, but it wouldn’t be the whole story, and we should be realistic about what we face. One way to vote every day or at least every week: become a socially and environmentally responsible consumer. 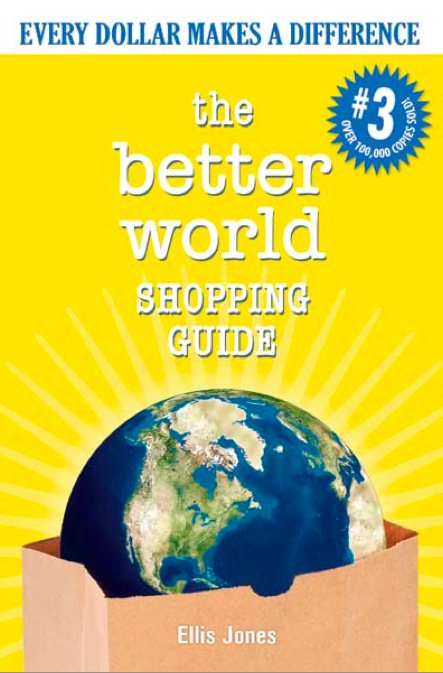 To find out which companies are ranked higher because they are aim for sustainability, protect animals, support family farms and local businesses, and/or follow the best human rights and social justice practices, order The Better World Shopping Guide, by Ellis Jones. It’s just $10 and small enough to carry around until you have memorized the best and worst companies in the categories you buy most often–from pet food and chocolate to cosmetics and coffee. Or use the website betterworldshopper.com, starting with the Best 20 Companies. Chances are you already buy products from some of these, like Tom’s of Maine, Method, Organic Valley, Clif Bar, Patagonia, Kettle Foods, Ben & Jerry’s. This will make you feel good, which will sustain you as you realize how hard it is to avoid supporting the worst companies: Proctor & Gamble, Nestle, Kraft, Archer Daniels Midland, GM, GE, and Tyson Foods, all among the worst. The rankings of best and worst, from A to F (yes, it’s a kind of report card on businesses), are based on a myriad of reliable sources of information on corporate behavior, such as a company’s environmental record, contribution to climate change, donations made, fair trade sources, and ethical business practices. If you spend $18,000 a year on consumer goods and services (the American average), think of it as 18,000 votes for a better world.